Jazz Haven held a special event to kickoff the 2015 New Haven Jazz Festival and to honor Barbara Lamb, the 2015 recipient of the Unsung Heroes Award on Thursday, August 6, 2015. On hand to present the award was fellow musician and Jazz Haven Board member Jesse Hameen, II. Beginning in 2012, Jazz Haven, Inc. has honored, through it’s “Unsung Heroes” award, one or more persons for their commitment, dedication, and contributions to the jazz scene in the greater New Haven community. Barbara Lamb served as the Director of Cultural Affairs for the City of New Haven for 14 years, responsible for producing the New Haven Jazz Festival from 2001 until 2006. After the City’s unfortunate decision to combine the jazz fest with its other summer concert series, Barbara supported Jazz Haven’s efforts to assume responsibility for reviving and restoring the festival to its rightful place on the NH Green. Working with Doug Morrill and, later, Craig O’Connell, Martha Meng and others, Barbara helped to secure sponsorship dollars and city support for marketing, public safety and permitting in order to minimize costs and maximize volunteer efforts. 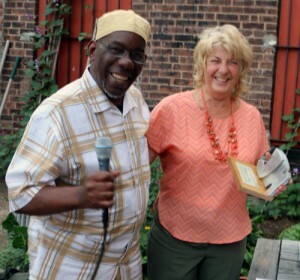 In 2012 Jazz Haven honored the Monk Family with its Unsung Heroes Award and in 2013 the Award was bestowed upon Kim Futrell in the Office of Arts, Culture & Tourism for the City of New Haven. The 2014 recipient was jazz bassist and educator Jeff Fuller. The event was held on Thursday August 6, 2015 on the patio at 116 Crown, 116 Crown Street in downtown New Haven. Music was provided by Isabella Mendes and Jeff Fuller.